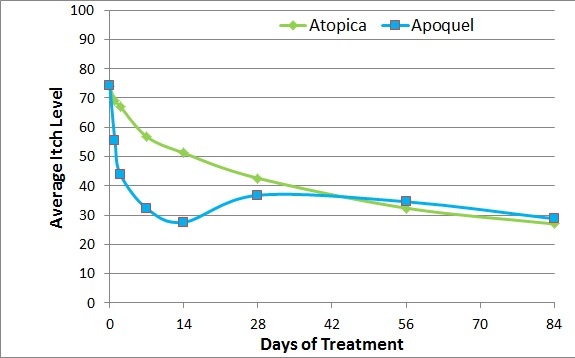 ← Retrospective evaluation of Apoquel® (oclacitinib) for the treatment of 117 dogs with atopic dermatitis. Part 1: control of pruritus (itch). This entry was posted in allergic dermatitis, apoquel, Atopic Dermatitis, atopica and tagged allergic dermatitis, Apoquel availability, Apoquel back order, atopic dermatitis, atopic dermatits, atopica, cyclosporine, dog, dog itch, oclacitnib, pet, skin. Bookmark the permalink. We have a 13 yr.old Border Collie.. She was a 3 mo. old rescue. when we got her from the Humane Society in Calif. She has always had skin problems. Nothing ever worked for her. We moved to Ohio, in 2009. Our vet put her on Atopica, It was like a mirical, no itiching at all……Took her off for the winter, and when we put her back on in the spring, we gave her a pill on Saturday evening and had her in ER at midnight,. They gave her a cortisone shot, that really helped. Next night same thing happened, back to ER. Went to our Vet on Mon. She called the manufacture and they said 2% of dogs will have this reaction on the second time around. So this year she put her on Apaquel. The first night she had a seizure. We have not given her anymore, and she has been fine, except for the itching continues. Do you have any suggestions? We really need help. I don’t believe seizures have been linked to Apoquel. Hopefully your vet reported it to the drug manufacturer Zoetis. Allergy immunotherapy may be an option for your dog. Ask your vet. This is the ONLY product that has work for my dog. However, I can not find anyone to re-fill his prescription. No one has the product! Can i order online? Charles, Apoqeul would need to be prescribed by the veterinarian who takes care of your dog. They will be able to fill you in on the details of their supply, but in general, the supply of Apoquel is improving slowly but surely. We have a dog crossed with golden retrevier weighing 28kg and sterilized. It has recurrent episodes of itching that we control with prednisolone for 6 days at doses of and 30-25-20-15-10 and 5 mg and let rest until they scratch a lot. (Veterinary prescription). We tried many feed and some very expensive but it doesn’t goes better. We want to trie it with atopic or Apoquel. You’ll need to talk with your dog’s veterinarian to get a recommendation. There are a number of things to consider — availability, concurrent medications, etc.